Written with the absolute beginner in mind, this book teaches all the basics for machine sewing with step-by-step instructions and photographs. Sewing skills are learned by working on projects, beginning with something very easy and getting progressively more difficult as the reader works through the book. New skills are explored in depth as they are introduced. 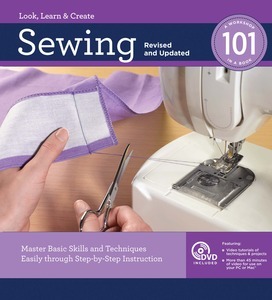 The projects are divided into two sections: garment sewing and home decor/accessory sewing, making this the most comprehensive beginner's book available. An accompanying DVD includes complete step-by-step sewing basics, demonstrates all projects, and offers the complete book pages in PDF format.